I use VMware and Linux on my Windows rigs with better results than I get with the Windows SMP client so I figured I would pass on the info a short how to.. Usually nets me an extra 50-75 ppd so it's not much, but every little bit helps and boosts the team.. There is so much more that VMware is capable such as setting up custom virtual machines, to check compatibility of components within an OS. Comes in handy with some Linux Distros, "cough" Gentoo for finding and repairing broken packages without crashing your real install. Your CPU must be a 64-bit AMD Dual Core or a 64-bit Intel Dual Core or higher with support for Virtualization Technology. NOTE: Make sure you don't have Winrar or any other program like Winrar associating itself with ISO files. * above it click Register and get your serial number. There are tabs at the top of the VMware window to go between home and your selected virtual machine. * name it or leave at defaut. * Disk Capacity around 6.0 GB and select Allocate all disk space now. 5) Click on Edit virtual machine settings. * CD-ROM - under Connection select Use ISO image and navigate to where you saved the Ubuntu download. 6) Click Start this virtual machine. 7) Run the Ubuntu Installer in the top-left corner. * enter in information for Who are you? 9) Start up the Virtual Machine. Now you must configure the client. Leave the Terminal Window up so you can monitor the progress. * Alt+Ctrl puts your mouse back in Windows. * Ctrl+C stops the client. Last edited by ccperf721p; 24th September, 2007 at 05:18 AM. 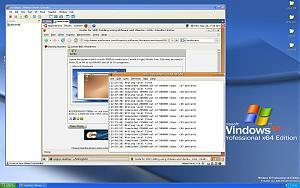 VMware is a quite powerful program in itself and may offer benefit to some people. It has proven itself useful to me time and again. Plus it's a great way to take a Linux Distro for a test drive without making any changes to your rig and still allowing full use of the Linux OS. This is great stuff. What a big addition. I'm basically software challenged, but my friends, who actually use their computers to make a living, are forcing me to put my computers and my mind to good use. They drop a project a month on me so I should be able to get a guide, how to, or just a review of some of the cooler stuff we can use on our rigs at the same pace..
Bear with me though, 36 and I am using a program to finally learn how to type..
Last edited by ccperf721p; 24th September, 2007 at 04:42 AM. Feel free to submit an article for publication with us: $25 for qualifying articles that we accept for publication. You can learn the details here. Last edited by Gizmo; 24th September, 2007 at 04:50 AM. Beat me too it!! I just came back to this thread to post that!!! Front paged, Sweet.. I'll continue to do up the articles, they will get better as time goes by. I can't accept money for the articles though. If I had to pay for the information I wouldn't have it, so I pass it on for free as well..
Last edited by ccperf721p; 24th September, 2007 at 05:04 AM. I gave the guide a quick run on XP64 to make sure I wrote it right. Works fine. Can also be used in Vista 32 or 64 to run WinXP and all of it's programs..
Last edited by ccperf721p; 24th September, 2007 at 03:21 PM.